Havana street scene in 2010. 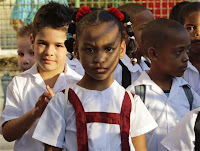 Inset below: school kids in Havana, 2010. Photos by Desmond Boylan / Reuters. Cuban society has been an experimental laboratory... If one set of policies became problematic, the Cubans moved in different directions. Usually change came after heated debate at all levels of society. I participated in the 2012 “Seminar on Socialist Renewal and the Capitalist Crisis” co-sponsored by the Radical Philosophy Association and the Institute of Philosophy, University of Havana. More than 40 U.S./Canadian/ Latin American scholars met in conference with at least 75 Cuban scholars in a five-day conference to discuss the political and economic changes occurring in Cuba and the United States. ...the Cuban revolution (even until this day) has constituted a living experiment that most progressive forces around the world identify with. Even though each society has its own history, class structure, level of development, and revolutionary potential, Cuba’s desire to create a government to serve its people and at the same time to transform them from a traditional consciousness to a revolutionary consciousness is shared by progressives everywhere. For progressives, Cuba is a laboratory, a grand social experiment that will provide knowledge for others as they seek fundamental change in their own societies... Cuba’s successes in the years ahead are successes of all progressive forces and, similarly Cuba’s defeats are defeats for all who wish to create egalitarian and humane societies. The idea of “revolution” refers to a fundamental transformation of economic and political structures and peoples’ consciousness of their place in society and the values that should determine human behavior. Also, revolution is not a fixed “thing”but a process. That means that changes in structures, patterns of behavior, and consciousness are changing over time and in the case of revolution are moving toward, rather than away from, more complete human fulfillment. What has been most fascinating to observe about the Cuban Revolution is its constantly changing character. Cubans have debated and made decisions about gradual versus fundamental changes, the need to experiment with different ways to allocate scarce national resources and, most critical, how to respond to external economic, political, and military assaults. Cuban society has been an experimental laboratory, changing public policies as contexts demand. 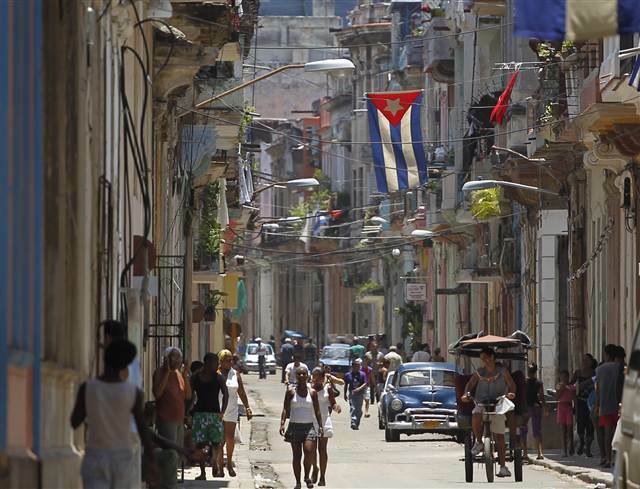 If one set of policies became problematic, the Cubans moved in different directions. Usually change came after heated debate at all levels of society. For example, after the 26th of July Movement seized power, the revolutionary regime launched programs to reduce rents for urban dwellers, established a nationwide literacy campaign, and after a cool U.S. response to the new government, put in place a large agrarian reform program. As United States hostility escalated Cuba established diplomatic and economic relations with the former Soviet Union. From that point U.S./Cuban hostilities became permanent. In the mid-1960s, Cuba engaged in a great debate, to some degree unresolved, between those who wanted to move the Revolution along the path to “moral incentives,” that is creating a society in which people act because of their commitment to communist ideals, versus those who argued that in the short run “material incentives,” wages and benefits, needed to serve as the source of human motivation. Later, the Cuban government embarked on a campaign to produce more sugar than ever before to earn scarce foreign exchange in order to advance the domestic economy. The 10 million ton sugar campaign failed with negative consequences for the sectors of Cuban society that were ignored. Then Cuba embraced the Soviet model of development, including joining the Eastern European Common Market. By the 1980s, while the economy grew, Cubans saw a decline in the commitment to the Revolution. This recognition led to a campaign of “Rectification,” to reinstill in society and consciousness, the spirit of the Revolution. When the Socialist Bloc collapsed between 1989 and 1991, once again the Cuban Revolution had to adapt. “The Special Period” was instituted in the face of a decline in the economy of at least 40 percent. The Revolution survived, contrary to the predictions of outside experts. In the 21st century, despite devastating hurricanes, a global economic crisis, and an escalating United States economic blockade, the Revolution continued. Now, the Cubans are embarking on a new set of policies that are designed to overcome economic stagnation, inadequate agricultural productivity, bureaucracy and corruption in government, and insufficient grassroots participation in decision-making, particularly at the work place. After extensive debate in the society at large, from the leadership of the Communist Party to virtually every workplace, neighborhood and village, the Cubans have decided on new structures and policies. The new policy guidelines include the expansion of a market in the production of goods and services. This expansion will include a dramatic shift of employment from the state sector to self-employment. Emphasis will be placed on developing cooperatives in manufacturing and services as well as in agriculture. In the agricultural sector efforts are being initiated to encourage a dramatic increase in those who can return to the land, increasing domestic food production while reducing the need to import food from abroad. New forms of grassroots participation in addition to revitalizing the mass organizations will occur. And the ration system of food distribution will be replaced by the establishment of a safety net for those still in need of food. And where possible, enterprise autonomy, such as in the renovation of Old Havana, will be encouraged and supported. The new guidelines, over 300 in all, are designed to renovate economic and political institutions, stimulate local entrepreneurial enterprise, increase political participation, and overcome the continuing economic crisis that a small country such as Cuba finds itself in as a result of natural and political disasters as well as a continued effort by the “Colossus of the North” to overthrow the regime. Debate within Cuban society (and among our North American delegation) about these new guidelines has been animated. Perhaps most basic is the concern about whether the economic reforms will undermine the Socialist character of Cuban society after over 60 years of struggle. Some worry that the introduction of markets may undermine the spirit of compassion and revolutionary consciousness that was inspired by the heroic Che Guevara and the band of scruffy revolutionaries who overthrew a neocolonial regime in 1959. Still others debate about whether cooperatives constitute a productive and yet inspirational step in the long history of building Socialism and Communism. And what about youth, people ask. Is the revolution ancient history for young people, a youthful population that has had access to a rich educational experience and live a healthful life. Will they have the same fervor for the Revolution that their elders and foreign friends have had? And, in fairness to the young, how can the Revolution be preserved while serving the lives of people whose historical experiences are different from their elders? There are no easy answers to these questions; no guarantees of success; no convincing narratives of a linear development from a contradictory present to a utopian future. But, as I clearly saw in 1990 when I started attending meetings of U.S. and Cuban scholars, there is reason for hope. The Cuban Revolution has survived, given so much to the world, and continued to intrigue progressives everywhere. I returned from my encounter to Cuba in June 2012, with renewed optimism.